If the defining Netflix comedy special of 2018 was the emotional gut-punch of Hannah Gadsby’s Nanette, Joel Dommett’s Comedians Of The World offering might prove an antidote. 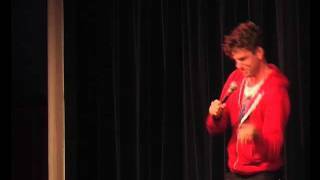 For this is 30 minutes of joyously upbeat stand-up, with Dommett joyously sharing anecdotes of his own idiocy, from the vividly embarrassing tale of getting caught short en route to a Gay Times photoshoot to a confession that he was obsessed with nunchucks as a child, a far less intimidating martial-arts skill than he thought. The most memorable of these routines is his solution to the universally familiar dilemma of needing to get past your sleeping neighbour on a plane. 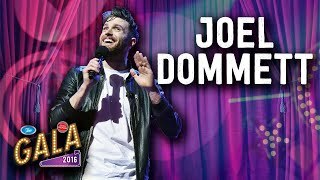 Dommett’s recreation of this moment is an unusually physical performance for a stand-up special, but a very funny one – heightened by a subtle bit of foreshadowing in his choice of in-flight movie. Such detail shows how smartly and meticulously this set has been put together, from organic callbacks to the way he gives the crowd permission to laugh early on, permeating any initial hesitancy they have. But there’s also some substance to this special, when it touches on the awkwardness of father-son bonding. Dommett affected an interest in Formula 1 to relate to his dad, which worked much better than an invitation to an experimental restaurant which turned out not to be designed for tender father-and-son moments. The routine turns out to be heartwarming, without the comic overplaying his hand. And the very fact that he has made this Netflix special has the same effect, showing how far he’s come from when he was the living cliché of the pupil who turned class clown to avoid being bullied. This isn’t his funniest section (including a hackneyed ‘…and that was just the teachers’ line) but brings a satisfying closure to a very amusing half-hour of cheerful confession.